Imagine feeling the heat of a summer day as you sit inside a tin-roofed church building listening to a pastor preach to you from the Word of God. The echoes of voices resound as the congregants speak out their appreciation for what they are hearing. This is Africa. This is church. This is worship around the Word of God where Jesus is the center. 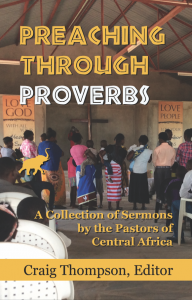 This collection of sermons by the pastors of Central Africa contains stories, questions, and commentary on the Book of Proverbs by the men and women who daily live out their faith in the trenches. Order your copy today by using the main contact form on this website or by ordering it on Amazon. Submission form for errata found in the Preaching Through Proverbs book. Please don't change this unless you have a good reason to. Please use this format for your submission: Page number, "identifying text", "suggested correction." Example: 217, "went to to the store", "went to the store."